A flow meter is a device or an instrument used to measure linear, non-linear, mass or volumetric flow rate of a liquid or a gas. Flow meter is referred by various names such as flow gauge, flow indicator, liquid meter, depending upon the particular industry; however the function, to measure flow, remains the same. Demand of intelligent flow meters is increasing day by day as they are highly accurate, precise, stable and reliable for flow calibration. Intelligent flow meters are not affected by temperature, viscosity, density and suspended particulates. Intelligent flow meters are widely used for diagnostic information, along with measurement of data, which will stimulate the growth of intelligent flow meter market globally. Chemical, food & beverages, oil & gas, metals & mining, pulp & paper, pharmaceuticals are the few industries where intelligent flow meter is widely used. Among various industries, there is a high demand of intelligent flow meter in Oil & Gas industry. Magnet flow meter holds the large amount of share of the intelligent flow meter market as it is used for the measurement of dirty water. The intelligent flow meter market, in terms of value, is estimated to be around USD 6 Billion in 2016 and expected to grow rapidly during the forecast period at a CAGR of around 7%. There is high demand of intelligent flow meter market in chemical & wastewater industry and in Oil & Gas industry which will stimulate the growth of intelligent flow meter market.The global intelligent flow meter market is studied for the Asia Pacific (China, Japan, India and rest of Asia Pacific), North America (the U.S., Mexico, and Canada), Europe (the U.K, Germany) and Rest of the World. After Asia Pacific, Middle East and Africa being the largest region in the consumption of intelligent flow meter. North America and Western Europe shows the healthy growth in terms of consumption of intelligent flow meter due to the rise of industrialization and expansion of large number of shale gas projects in these regions. There is a high demand for intelligent flow meters in Oil & Gas and Chemical & wastewater industry in order to calibrate the fluids accurately and precisely. Intelligent flow meters are accurate, precise, stable and reliable. They are unaffected by temperature, viscosity, density and suspended particles. With the increasing need for reduced uncertainty among metrologists to improve the calibration standards for flow is a key factor driving the growth of the global intelligent flow meter market. Lots of innovations have been made in ultrasonic measurement technology, which demands the growth of intelligent flow meter market globally. Recently, Emerson Automation Solutions (Nidec Corporation) has launched the Rosemount 8600 Utility Vortex Flow Meter that is specifically designed for utility applications. The key growth factor of intelligent flow meter is the growing use of intelligent flow meter for diagnostic information and flow calibration in various industries and commercial applications. 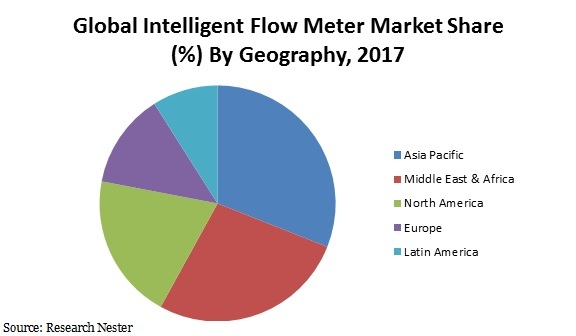 Increasing investments in the field of process automation in APAC, along with the growing demand for accuracy in measurement processes in countries such as China and India, are driving the growth of the market for intelligent flow meters. However, the high initial cost of intelligent flow meter is one the major barrier for the market growth.